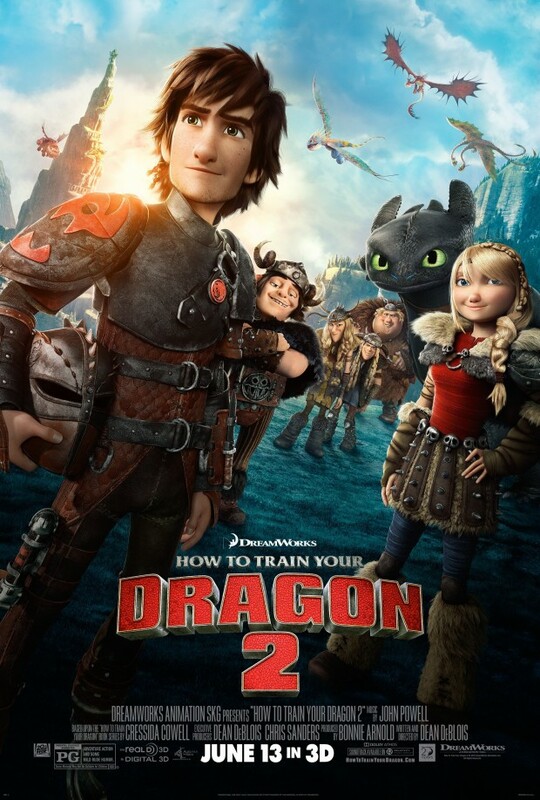 Dreamworks follows up the excellent How to Train Your Dragon with the highly anticipated follow up How to Train Your Dragon 2. This time the film is solo directed by Dean Deblois with Chris Sanders not returning. Five years have passed since the first one and the island of Berk is thriving because of the recent collaboration between humans and dragons enhancing their lives in almost every way. Life seems happy for all concerned and Stoick (Gerard Butler) is on the verge of passing on his position as Chief of the island to his son Hiccup (Jay Baruchel). As you might expect Hiccup isn’t quite as interested in this position as his father would like him to be which creates some early conflict that feels like it could turn out to be the central focus of the film until it doesn’t. Hiccup and his faithful dragon Toothless stumble across an ice cavern home to a large number of dragons as well as a mysterious -unless you’ve seen the trailer- dragon rider who lives with them and tries to protect them. Naturally this is made difficult by the film’s main villain Drago (Djimon Hounsou) who has specific beliefs putting him in conflict with our main characters. I was pleased to find out that this film feels like a genuine sequel instead of an attempted cash grab that echoes the first film in almost every way, the characters have grown and changed since the last one and everyone who has a character arc is on a different journey. This is quite refreshing in kids films as well as sequels in general. The plot’s initial focus is on Hiccup convinced that he can change Drago’s mind about dragons in the same way that he changed his father’s mind in the first one, this could easily have led into a rehash of the first film’s story with a similar resolution and in lesser hands it might well have gone down that way. Instead Hiccup gets a stern reality check and finds out that not everyone can be reasoned with meaning that he has to know when battles must be fought in order to stand up for what you believe in. This is a fascinating character arc that tests Hiccup’s resolve in new and interesting ways as he finds out that diplomacy doesn’t always work the way that he wants it to. It definitely feels like he grows even further in this story and is still left flawed at the conclusion. Another interesting point to bear in mind about this film is that the main character is living with a disability, having lost his leg in the first film and walking using a prosthetic in this one. His dragon Toothless is similarly handicapped needing artificial means and a pilot to allow him to fly. I wonder if this was a deliberate attempt to give children living with similar disabilities a hero to look up to and help them feel represented in cinematic form but even if not it’s a welcome change of pace for a heroic figure. The disability never becomes part of the plot and it’s not seen to be making Hiccup’s life any more difficult as a result; it’s a great message to give to kids and is probably providing many people hope somewhere, nice work. The weak link here would be Drago who isn’t as well fleshed out as I would have liked him to be. There are some last minute revelations that retroactively make up for some of this but on the whole I feel that his character could have been developed more organically. At times it feels like there are more characters than the film has time for, they never really slow down the story to a massive degree but some of the well developed characters from the first installment are so minor that they may as well have not been in it. In terms over which film is better out of this and the original I would say that it comes down to personal taste. In terms of quality both films are about even so it comes down to what story people might have had more fun with. This film is a bit darker and goes to some lengths that younger children might find unnerving but functionally it is as good as the first installment. I will say that personally I thought the first one was a better film, I had more fun with the story of the first one and thought the majesty of dragon riding was better executed there. Overall, an excellent family film with plenty to be enjoyed by people of all ages. It’s a rare example of a genuine sequel that matches -and arguably surpasses- the quality of the first installment. At no point does it talk down to the audience and the characters feel as rich and well developed as ever. The villain could have used some work and at times there are more characters than I could keep track of but it’s just a really good film.